Prince Louis asleep in the Duchess of Cambridge's arms on the day of his christening. The Cambridges stepped out for the first time as a family of five for Prince Louis' christening on Monday. Naturally, all eyes were on the two-month-old prince, who looked adorable sleeping in his mother's arms as she approached The Royal Chapel at St. James' Palace. The Duchess of Cambridge and Prince Louis arrive for his christening at the Royal Chapel. The Duchess of Cambridge and Prince Louis. 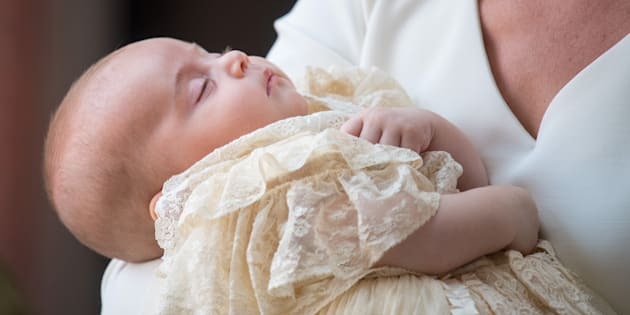 Louis was dressed in a replica of the Royal Christening Robe, which was originally made in 1841 for Queen Victoria's daughter, Princess Royal. Louis' siblings, Prince George and Princess Charlotte, wore the same gown for their own baptisms, Hello magazine reports. Unlike his siblings, however, Louis did not have his baptism in the early morning. Instead, his took place at 4 p.m. GMT. The Cambridges and their children walk to the Chapel Royal, followed by Prince Harry and Meghan Markle. Justin Welby, the Archbishop of Canterbury, led the ceremony, which had roughly 21 guests in attendance, including Prince Charles, the Duchess of Cornwall, the Duke and Duchess of Sussex, the Middletons, and Louis' six godparents and their spouses. Her Majesty and Prince Philip were noticeably absent at the christening. According to royal correspondent Richard Palmer, of the Daily Express, the Queen did not attend due to her busy schedule. Why isn't the Queen going to Prince Louis's christening? I've spoken to a couple of sources and the explanation seems to be it's another busy week for the monarch at 92. She has the RAF centenary tomorrow, a meeting with President Trump on Friday and audiences in between. Regardless, the private ceremony was full of significance thanks to its location and date. Not only was Louis christened at the same chapel as his brother George, but his aunt, Meghan Markle, was also secretly baptized at St. James' Palace ahead of the royal wedding in May. Additionally, the ceremony was on the same day his great-grandparents, Queen Elizabeth II and Prince Philip, got engaged 71 years prior in July 1947. As the Cambridges were all smiles as they emerged from the chapel following the short 40-minute ceremony. They then walked with their guests a short distance to Clarence House for a private tea service. According to royal expert Victoria Howard, crowds of fans gathered outside St. James' Palace hoping to catch a glimpse of Prince Louis, but due to the private nature of the event, there was no such luck.